This post is dedicated to my best friend, who has called me beautiful every time I have ranted to her about my blemishes, stretch marks, protruding tummy and highly visible body fat, not ’cause she wanted to shut me up with blatant lies but because she actually thought I had beauty inside me. Synopsis : Is it only in India where people don’t realise that starting a conversation with “Oh, you’ve put on weight” is incredibly rude? Perhaps I should respond with “Oh, you’ve become uglier!” so they get the point. From stores that do not stock clothes my size to unsolicited advice from neighbourhood aunties, my life-quite annoyingly-is ruled by the numbers on the scale. What’s the big deal about being big? You may wonder. Well, quite a lot, actually. For starters, you get dumped by the only man you’ve ever loved, social situations go from awkward to embarrassing within seconds, and don’t even get me started on the family’s never ending search for a suitable groom. They just don’t make men my size these days! Nevertheless, here I am, about to meet Suitor No. 7. Begrudgingly, of course. Ride along as I navigate the crazy arranged marriage market. And trust me, it’s crazier when you’re more than a little curvy. 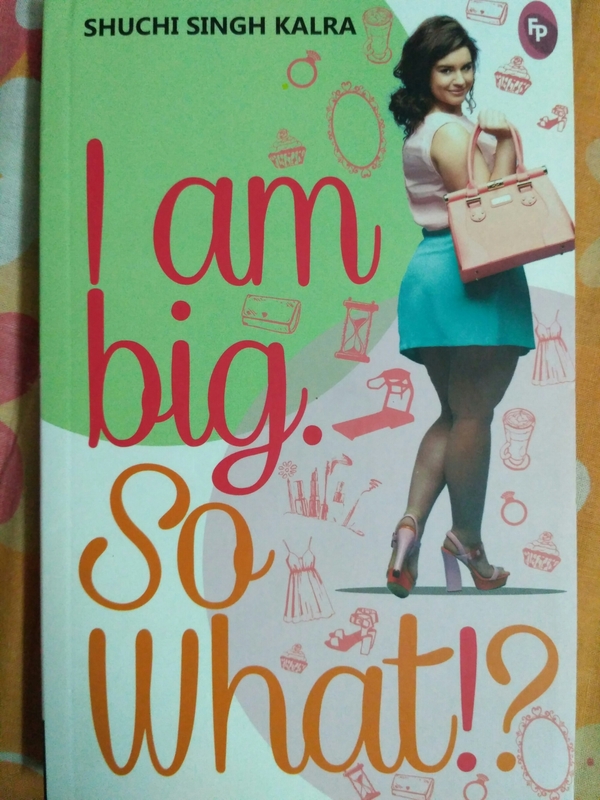 My view : A book that is called “I am Big. So what?” instantly caught my attention and I was adamant to read it. Generally my book intuitions are not wrong and yet again, I was proved correct. Countless times, I have been asked by those around me to watch what I am eating, slightly hinting at my already bloated body. Finding the right clothes of my size or listening to long drawn lectures of staying fit, I have had to deal with all the idiosyncrasies of the supposedly body perfect people. The society’s strange description of beauty has bothered many of us. Thus, it wasn’t that difficult to connect with Roli Kapoor who faced the brunt of the society’s stereotype of ‘big girls’. Having been slighted her entire life for her weight, she had slowly started accepting herself for who she was. Her sassy comebacks and witty oneliners surely kept haters at check. The fact that Roli had a really strong and confident personality was a welcome change to the notion that the world has about overweight girls. She was not moping in self pity but took charge of her life and naturally became an inspiration to many young women. However, Roli is just like any other girl who slides back when she faces criticisms and taunts from the people who haunted her past life. This is why her character is so relatable to the readers. She is as real as any girl we know. The other characters are also extremely alike to the people around us. The living and doting mother, the strict yet protective father, the awkward and caring sibling. I found many similarities between Monica and my best friend. Her unwavering support for Roli was admirable and adorable at the same time. Even after finishing the book a huge part of me was still attached to the characters and that is exactly how one can assess a book’s quality. The other points that were notable about the book are the light humour and the casual pace of the book. There is a heady mix of humour and entertainment throughout the book and the author’s style is laid back and unpretentious. The pace of the book makes it an easy read and the simple way out has been written attracts even the ones who aren’t book crazy. The book ends on a light note with a poem that strongly discourages body shaming. I think this book deserves a special place in the TBR of every person who has had to be humiliated, judged and dictated by the society for their uniqueness.